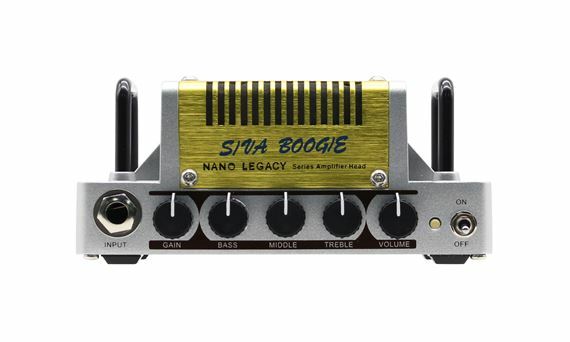 Order your Hotone Nano Legacy Amp Siva Boogie 5 Watt Mini Guitar Amplifier Head from AMS and enjoy 0% Interest Payment Plans, Free Shipping, Free Extended Warranty & 45 Day Money Back Guarantee. The 5-watt Nano Legacy Series amp heads produce premium guitar tones that faithfully emulate the sound of legendary guitar amps. With great sound and maximum portability, the Hotone Nano Legacy Series Amplifier Heads are optimal solutions for guitarists and bassists that want excellent tone for jam sessions, home studios, live stage setups and more. The Hotone Nano Legacy Series Amplifier Heads are the ultimate companions for guitar and bass players that want serious tone wherever they go. The Siva Boogie is inspired by the legendary Bogner Shiva and is an excellent addition to any player’s arsenal.